Published: Jan. 20, 2016 at 09:58 a.m. Updated: Jan. 20, 2016 at 12:57 p.m.
LeSean McCoy might be the best representation of what went wrong for Chip Kelly in Philadelphia. From their disintegrating relationship to the casting off of a talented player, he's the perfect example for Philly fans to point at when discussing Kelly's failure. Since being traded by Chip, McCoy has had no nice things to say about his former coach, who now takes over the San Francisco 49ers. LeSean McCoy on being traded, the differences between Rex Ryan and Chip Kelly, and his top five running backs going into 2016. On Tuesday night, McCoy joined NFL Network's NFL Total Access, and was asked what he would tell current Niners players about Kelly. "Every situation is different," McCoy said. "The one thing I will say about Chip is that he wants to win. He's very, very intelligent. The offense, they'll find ways to get the big numbers. They'll find ways to put the stats up offensively. With him coming in there, no matter how good of a player or low player you are, if you just automatically believe him -- no matter if it sounds crazy, you're like what is he talking about -- if you just automatically believe and buy in, I think you'll be fine." That's telling advice coming from a player who didn't appear to buy in to everything the coach was selling. Putting up numbers in Kelly's offense was never the problem. McCoy rushed for more than 1,300 yards in each of his two seasons in Kelly's offense, averaging 5.1 yards per carry in 2013 and 4.2 yards per carry in 2014. 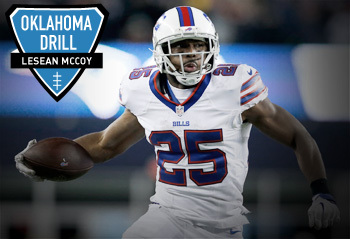 In 12 games with the Buffalo Bills in 2015, McCoy earned 895 yards rushing and 4.4 yards per tote. When asked to compare Kelly to his current coach, Rex Ryan, McCoy pointed to Chip managing everything, whereas Rex relies on locker room leaders. "His thing is how you approach the game," McCoy said. "(Chip is) monitoring everything, where Rex is more if it's a big game against whatever team -- you know how important this game is, I shouldn't have to tell you to study, I shouldn't have to tell you to get in your playbook, I shouldn't have to tell you those types of things. You shouldn't be out late, you should be already mentally focused for this game. Chip's more on you. He has his thing with the sleep and different things. They're obviously a lot different but they all have the same goal." With a fresh start in San Francisco, perhaps Kelly will employ some different techniques in how he handles his professional players.